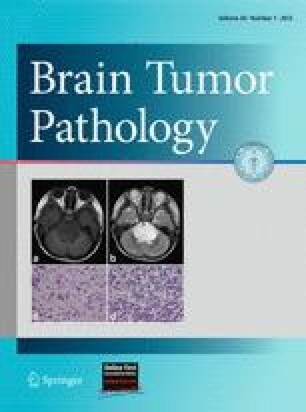 Papillary tumor of the pineal region (PTPR) is a recently described neoplasm. Several studies have been published on this tumor, but its pathological features and the appropriate treatment remain unclear. PTPR is reported to originate from ependymal cells in the subcommissural organ. Isocitrate dehydrogenase 1 and 2 (IDH1/2) mutations have been a focus area in glioma research as promising predictors. We report a case of PTPR that was characterized by local recurrence, although subtotal removal and radiotherapy seemed effective for many months. Histological examination showed ependymal features in the surgical specimens. As far as we are aware, this case study is the first to show that the IDH1/2 genotypes in PTPR cells are wild-type genotypes, which is consistent with the negative immunoreactivity that was observed for the IDH1 mutant antibody in this study.